We love tackling brain teasers, riddles, math puzzles, and mind ticklers here at PuzzleNation Blog. 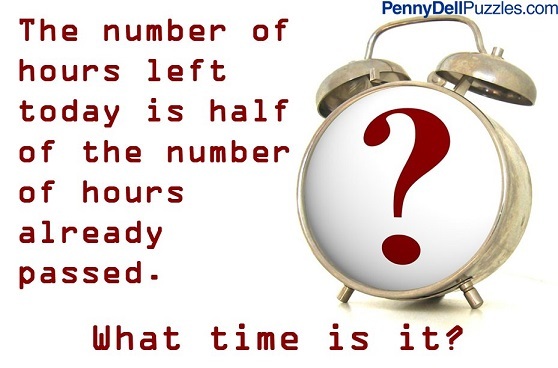 Our friends at Penny Dell Puzzles also enjoy putting their puzzly skills to work by posting various brain teasers..
And one of our mutual readers was hoping we could explain how to solve a puzzle that recently made the rounds on Penny’s social media accounts. Today, let’s take a look at a brain teaser all about time. So if you have the number of hours left — let’s call that X — then the number of hours already passed is twice X, or 2X. Between X and 2X, that’s your entire day covered. Sorting that out gives us the simple formula of X + 2X = 24, since there are 24 hours in a day. That easily becomes 3X = 24, and simple division tells us that X = 8. So X, the number of hours left today, is 8. Which means that twice X, or 16, is the number of hours already passed. And if there are 8 hours left in the day (or 16 hours already passed), that means it’s 4 PM. Most of the time, brain teasers are all about efficiently organizing the information we have. That allows us to figure out how best to use that information to move forward and solve the puzzle. This is just as true with a relatively straightforward brain teaser like this as it is with a complicated logic puzzle with all sorts of pieces to put together. It’s all about figuring out what we know, what we don’t, and how what we DO know can lead us to what we don’t. This entry was posted in Games, PuzzleNation, Puzzles and tagged Brain teaser, deduction, DIY puzzling, games, Geeking Out, math puzzle, mind tickler, Penny Dell Puzzles, Penny Press, Penny/Dell Puzzles, Pop culture, PuzzleNation, Puzzlin' fool, riddle, Wordplay by gmdirect. Bookmark the permalink.